I know this isn't the typical transformation post, but I have to share this book with anyone who is currently self-employed or even considering making that change. I love organizing physical clutter and, like most people, struggle with organizing my thoughts, ideas, and strategies as I build my business. This book is the perfect mix of how to's and the mechanics of being self-employed along with language that articulates the challenges of working for yourself (this is totally normal!) and everything in between. The book has built-in checklists and guides so that you can write in the book, take notes, doodle, whatever works best for you. Needless to say, I'm loving this book because it clarifies all the the things I need to be doing, but also is a great reminder that I should be proud of what I'm creating and that it is an exciting process (there are times when I need that little pep talk). Huge thanks to Launch Party Society who invited me to the trunk show and book release party last month - it would've been a while before I stumbled across this book on my own. 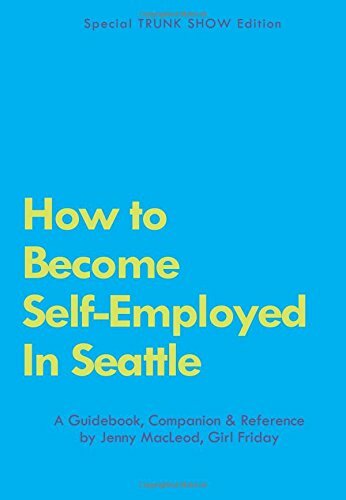 This book has helped transform my thinking about what it means to be self-employed. I'm in such a different space than seven months ago when I first made this change but am as excited as ever about sharing my work with people and having an impact on their lives. I'm oh-so-grateful to have this in my hands and you can too by clicking on the link below. When you pick up your copy here, you are also supporting this blog and my tidying mission. I would love to hear your reactions to this book and what you find most helpful. Let me know in the comments below!